In Maine near the Canadian border there’s a legend of a phantom locomotive sweeping through a peaceful village leaving death in its wake. Rum and narcotic runners use this and the villagers’ superstition to their advantage but a not as incompetent as he seems detective clears up the mystery of the specter and attendant deaths. His seemingly silly actions result in the apprehension of the evildoers and the little village and its station are finally at peace. For sheer, creeping mystery, it’s a play without a peer. The author Arnold Ridley achieved fame as Private Charles Godfrey, the gentle platoon medic, in the BBC comedy-sitcom, Dad’s Army from 1968 to 1977. This is the very first play performed by Faringdon Dramatic Society. The Dramatic Society was formed in 1948 from an evening class run by Bill Reeves. The first performances were in the Corn Exchange, while the rehearsals were held in the Friends Meeting House opposite the Duke of Wellington in the Lechlade Road and sets were built in garages and back gardens. Photo: Moving the scenery into the Corn Exchange for the first show. Below L to R: ?? 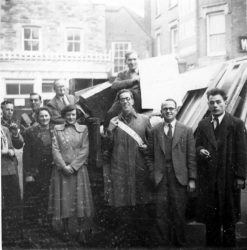 ; Stanley Mills; Nancy Reeves; G. Gregson; Margaret Carter; Ron Venn; George Young; ? ?.